Joshua Stephens is a transcontinental tribute. He is “sometimes from Seattle, Washington and sometimes from Cleveland, Ohio.” Making music self-described as “folk punk,” he utilizes ukulele, glockenspiel, and guitar to get his self-made sound. Writing all his own songs and co-producing his latest piece, it’s clear that Josh comes from District DIY. His newest collection, entitled “I’m Not Cute Like Jennifer Lawrence,” was released last month. The set list is 6 songs of cheek and charm. The first song slated is “We Can Be Friends.” The track is facile and familiar with a sound that makes me smile. 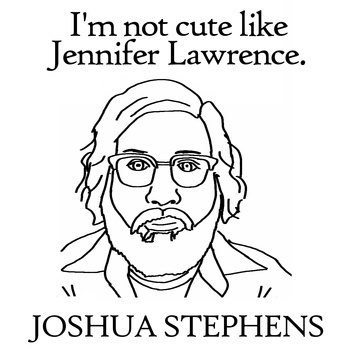 The second song, “I’m Not Cute Like Jennifer Lawrence,” is sympathetic and sweet. “I’m not funny like Tina Fey, but I think that I’m okay,” the song catchily concludes. “This is as Folk Punk as I Get” is the third song of the set. “I was never that great at first impressions, and I’m not that great at second ones either,” the lyrics altogether admit. I hope you still like me,” the song says, and the longing lyrics make me like it even more. Adding more cheek to the charm is the effervescent ending, “This One’s For the Cops.” “White, Black, Latino, they treat you all the same,” the song sarcastically says. “All my gay and trans friends also know there is no end…the cop is your best friend.” With the reaping of new music to write about, Josh Stephens and “I’m Not Cute Like Jennifer Lawrence” has secured a home in the Victor’s Village of do-it-yourself, local music-makers.